One of my favorite spring vegetables is the asparagus. They are quirkly little lookers and have such a great distinctive taste. Most times I prefer to slice them into salads, blanch them with shellfish, or sauté them as a side dish to dinner. 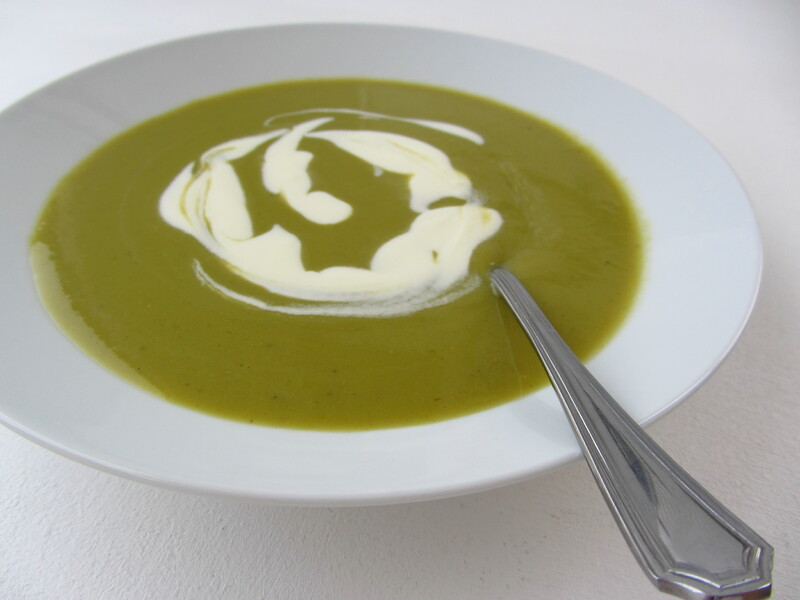 But with the nights being still a bit chilly here in San Francisco, it’s comforting to have this early season green in the form of a warm bowl of soup. Plus, the added jalapeno gives it just a little kick at the end, which I like. And even without the addition of cream, it still has a smooth, rich texture. What I love most about this recipe is that it is a really basic formula that can be used as the foundation for pretty much any other vegetable soup you would want to make. Oh and p.s: did you know, under ideal conditions, asparagus can grow up to 10 inches in one day! 2. While the onions are cooking, prepare the asparagus. Snap off and discard the tough ends, then cut the spears into 1-inch pieces. Once the onions are ready, add the asparagus and sliced jalapeno to the pot. 3. Add the vegetable stock, but only enough to just come up to the top of the asparagus. Bring to a boil, then reduce heat and simmer until asparagus is soft, about 15 minutes. Allow to cool slightly before blending. 4. Transfer soup mixture to a blender and puree until smooth. Return soup to pot, season to taste with salt and pepper. Serve with a dollop of crème fraiche (or sour cream) if desired. * Blend soup in two batches if necessary. When you go to blend, start at the lowest speed to avoid any possible heat build-up which could pop the top off the blender. * An immersion stick blender works too, but I think a countertop blender achieves a smoother texture. Plus, it is much quicker. * You can easily make this soup with any other vegetable, just swap the asparagus out for whatever is in season or available at your local market!